Sunflowers. Beautiful, cheerful sunflowers. Flowers that resemble the sun with their rays of golden yellow petals. 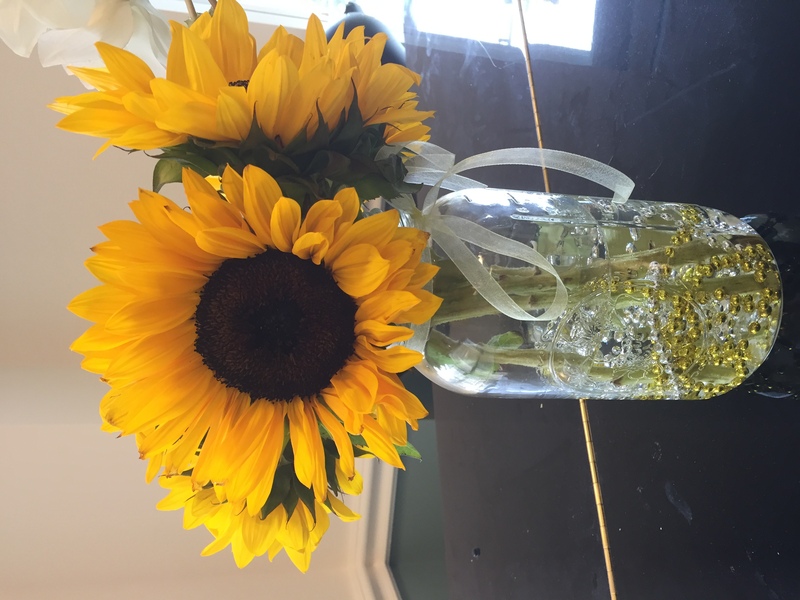 Aside from roses, sunflowers are perhaps the most recognizable and friendliest of flowers. 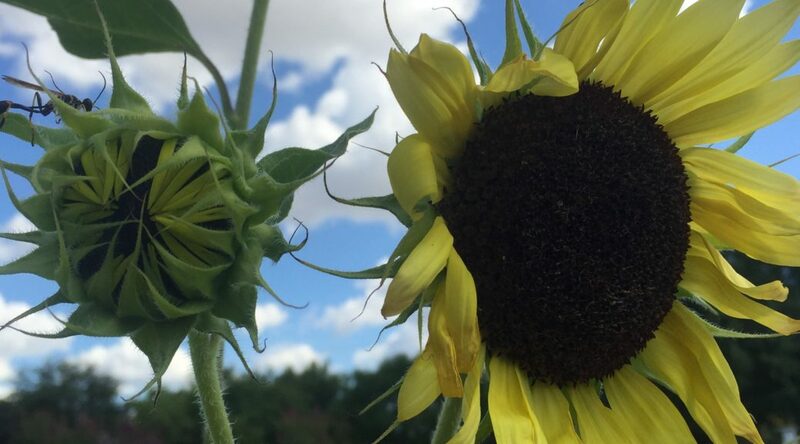 At the sight of sunflowers, people are often transported in their minds to driving past fields of sunflowers in the Midwest or seeing the mammoth sunflowers that grandma grew in the backyard – you know, the ones that towered over you as a child. Or, there is a memory of picking the ripe sunflower seeds of the spent flower. 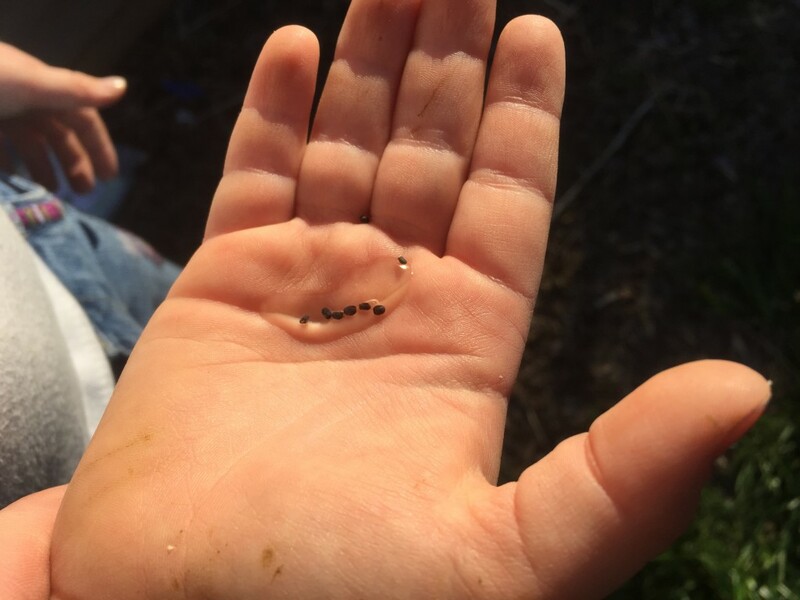 I can also remember watching birds swarming around ripe sunflowers – perched on the fence, tree branches, wherever and taking turns flying to the flowers, pecking off some seeds, landing on the ground to eat them, and then back again, with the occasional altercation or squirrel. Here are some interesting facts about sunflowers. 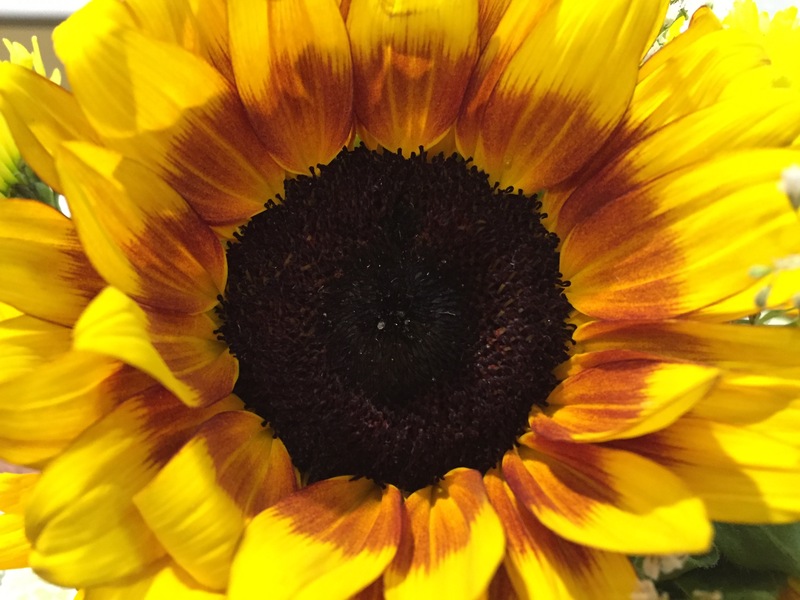 Sunflowers are Helianthus annuus, from the Greek words ‘helios’ for ‘the sun’ and ‘anthos’ for ‘flower.’ ‘Annuus’ for ‘annual’ references the flower’s complete life cycle in one growing season. Sunflowers are native to North America. Though several of my favorite plants are native to other parts of the world, sunflowers are native to this continent. Native Americans traditionally used sunflowers for culinary, medicinal, and dye-making purposes. 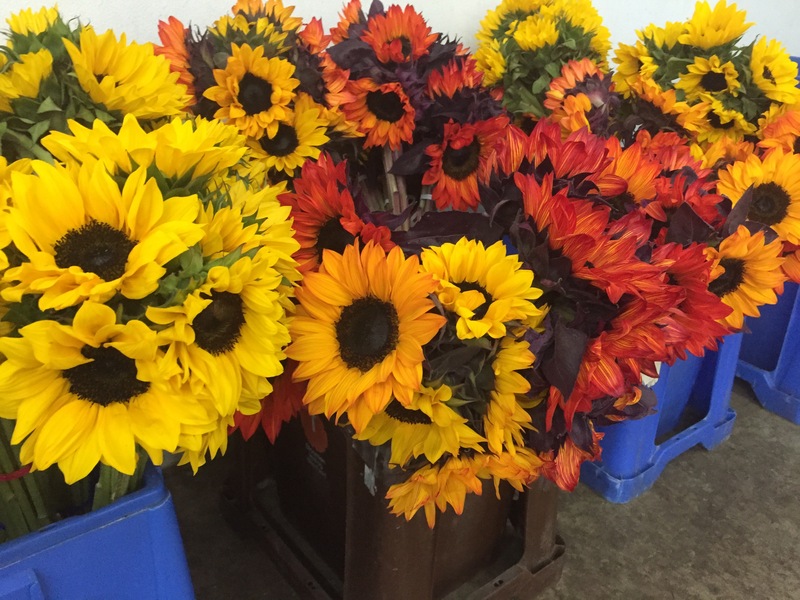 Sunflowers come in a variety of colors and sizes. The “traditional” sunflower has mustard yellow petals surrounding a dark center, atop a tall sturdy stem. 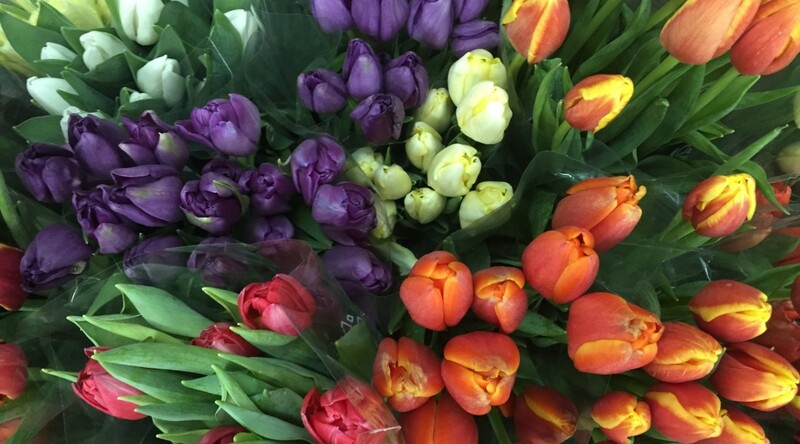 There are a multitude of different flower heights and colors. ‘Mammoth Russian’ sunflowers are as big as the name suggests and grow up to approximately 15 feet tall (Renee’s Garden). (Check out more tall sunflower varieties.) There are dwarf types, including ‘Elves Blend’ which grows 16 inches to 2 feet tall (Botanical Interests) – and then everything in between. 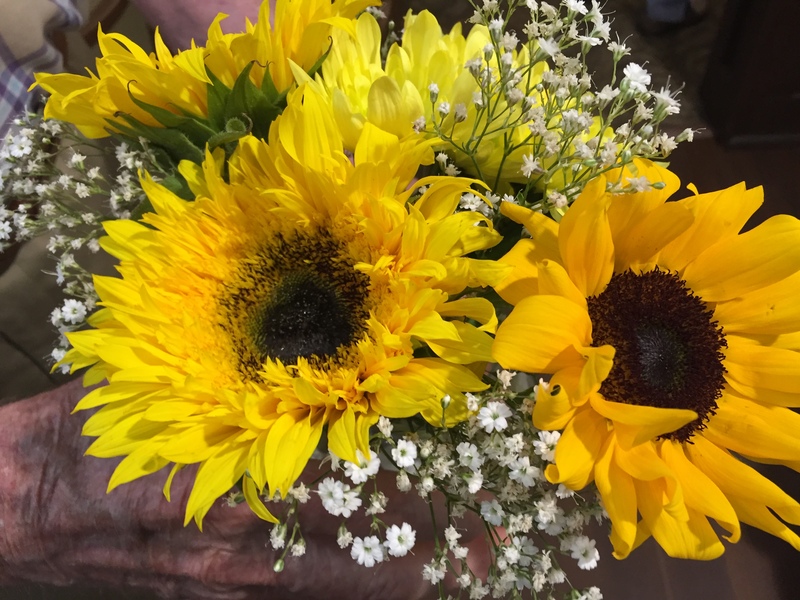 There are also sunflowers with the creamy yellow – almost white petals of ‘Vanilla Ice’ (Burpee), burgundy petals of ‘Chocolate’ (Johnny’s Selected Seed), and the bicolor flowers like ‘Strawberry Blonde’ (Johnny’s Selected Seed) or ode-to-Johnny-Cash ‘Ring of Fire’ (Seed Savers Exchange). 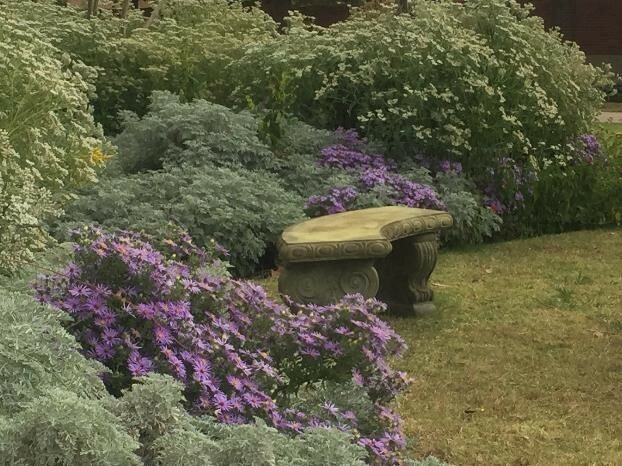 Check out the unusual, “shaggy blooms” of ‘Teddy Bear’ (Johnny’s Selected Seed) or the beautiful blend of fall colors of ‘Autumn Beauty’ (Seed Savers Exchange). 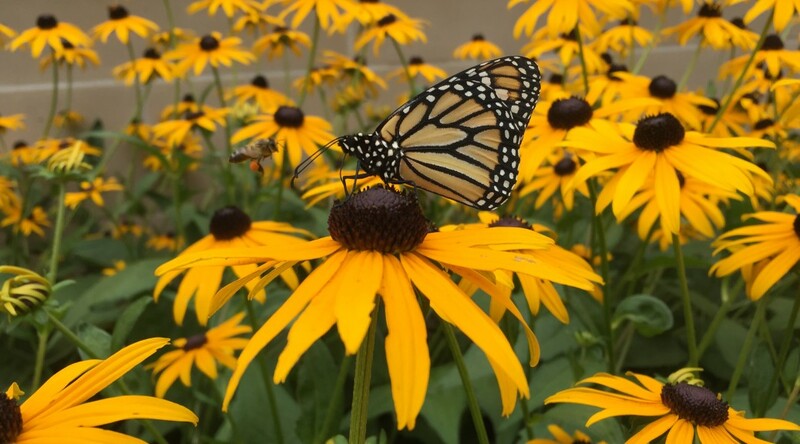 New in 2016 – ‘Sundancer’ grows quickly to 4-6 feet tall and blooms early in the season (Renee’s Garden). Sunflowers are hyperaccumulators – or “soil cleaners.” Sunflowers aren’t just pretty faces. 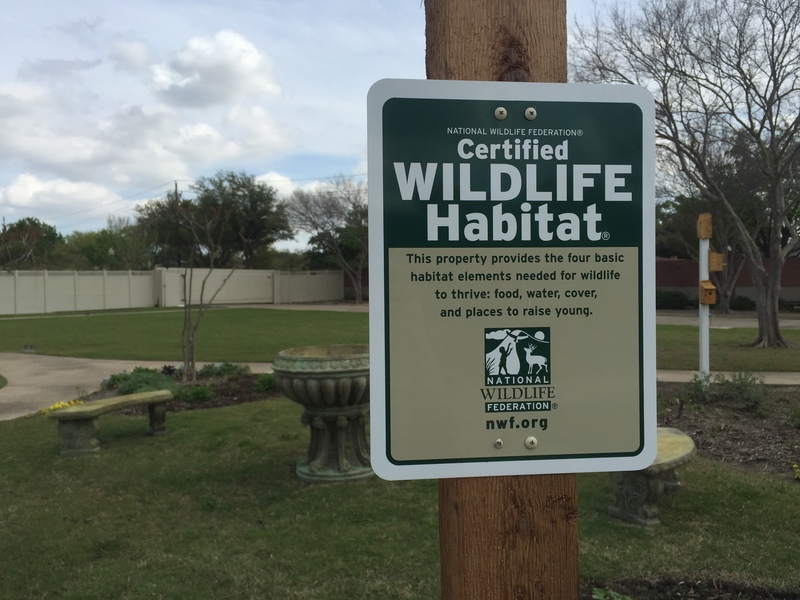 They are used in phytoremediation to help rehabilitate soils and groundwater that contain heavy metals, such as lead, uranium, and cesium. In fact, sunflowers were planted near Chernobyl and Fukushima to remove the toxins after the nuclear plant disasters. Young sunflowers track the sun’s movements in a process called heliotropism. 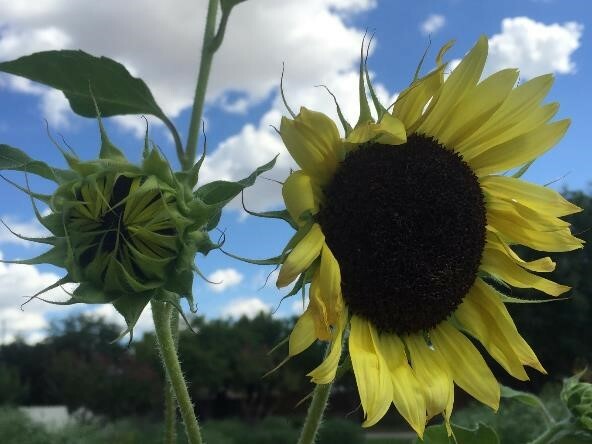 Perhaps one of the most interesting things about sunflowers is the young plants’ ability to follow the sun as it moves in the sky throughout the day. A young plant starts its day greeting the sun as it rises in the east. Then the tip growth moves during the day, “following” the angle of the sun before ending its day facing west at sunset. During the night, it resets itself to once again face east by sunrise in the morning. 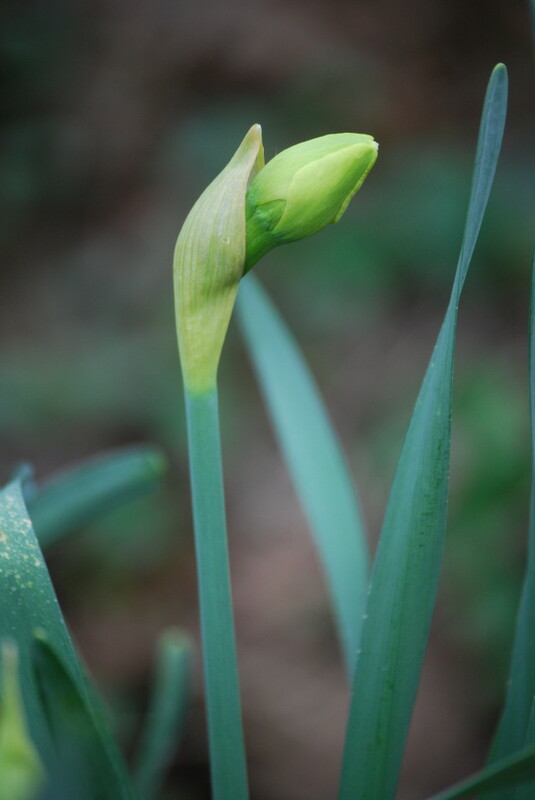 Eventually as growth develops and flower buds form, the stem hardens and becomes rigid, not allowing for further movement. The sunflower ends up facing east, generally speaking, and no longer tracks the movement of the sun. 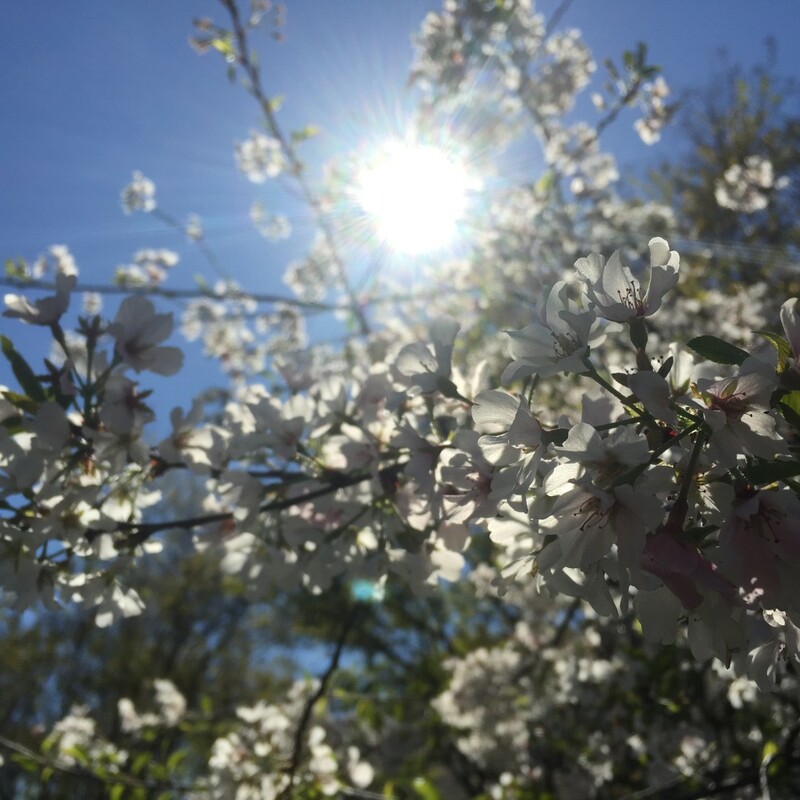 Read more about these flowers’ circadian rhythm and why the it tracks the sun. watch time lapse video of a sunflower seedling tracking the sun. 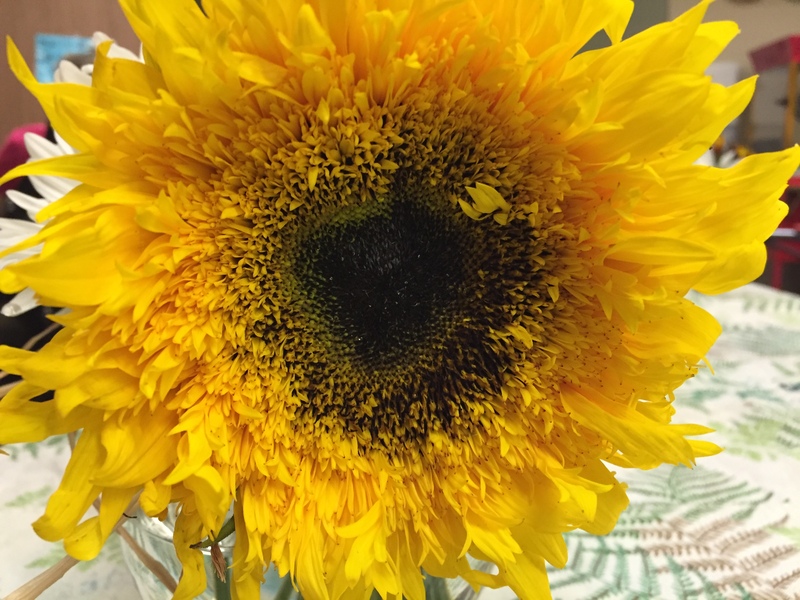 Have you ever noticed the Fibonacci patterns on the sunflower? 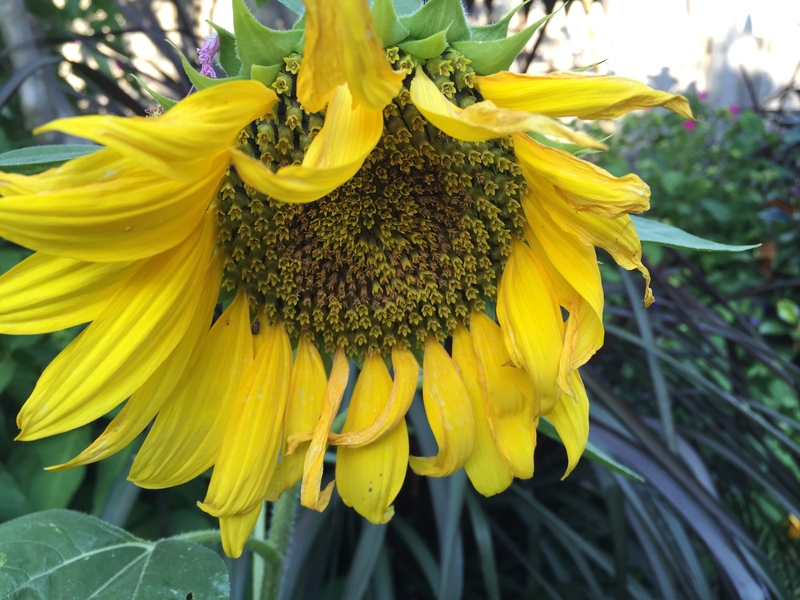 Look closely at the center of a sunflower, and you’ll notice a spiral pattern. You may have also noticed this pattern on agave, cactus thorns, snail shells, the Milky Way, hurricane formations, the bottom of a pine cone, and more. The sunflower florets are arranged in a unique mathematical pattern as to create a series of interconnected spirals. Read more about what causes this. Watch time lapse video of a sunflower seedling tracking the sun. 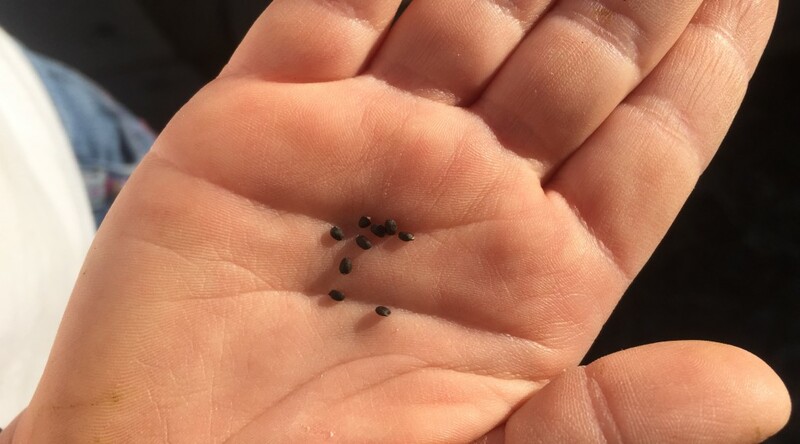 Sow sunflower seeds, either by direct sow in the garden or in pots to transplant later in the garden. Try growing the giant sunflowers in your garden – research how to grow the biggest, tallest varieties in your garden. 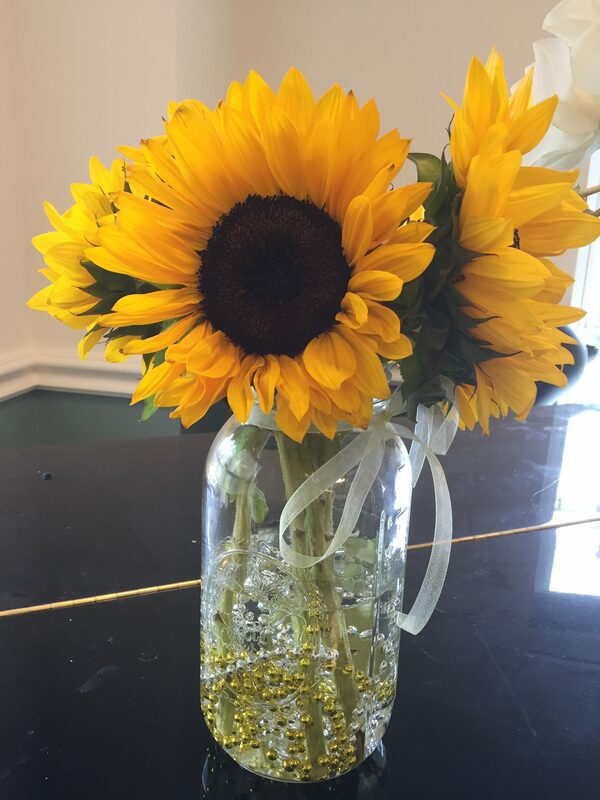 Create sunflower arrangements using flowers cut from the garden or purchased from the florist. Examine a sunflower up close. 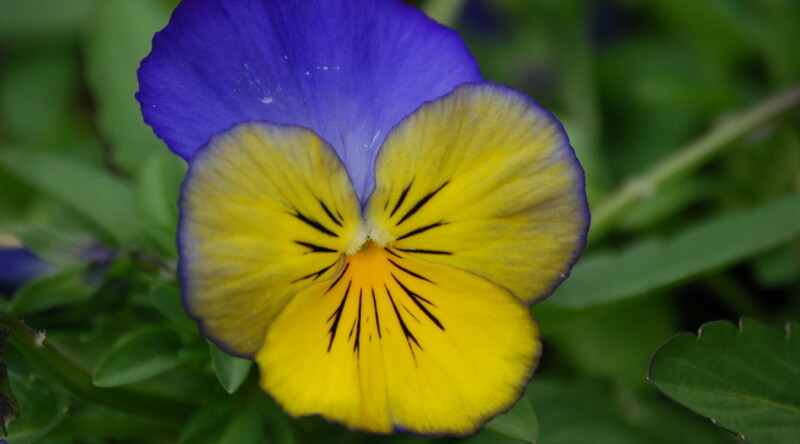 Notice the rigidness and height of the stems, the texture of the leaves and stems, the soft fuzziness of the point where the back of the flower meets the stem, the Fibonacci patterns of the flower’s “eye,” the colorful petals, the sticky part of the flower’s “eye” (at least on cut flowers, that is)…what else? This can be quite a grounding sensory experience. Notice the Fibonacci patterns of the sunflower florets and study other plants and objects in nature that also contain this pattern. Learn more about the Golden Ratio – this could possibly be a bridge, or lead into a conversation, about the Golden Rule: Treat others as you would like to be treated. Examine pictures of Monet’s sunflower paintings or Van Gogh’s series of sunflower paintings painted in anticipation of a visit from his buddy Paul Gauguin. Think about how nature has inspired the masters’ work, particularly Van Gogh who painted sunflowers in all stages – from young flowers to those past their prime. 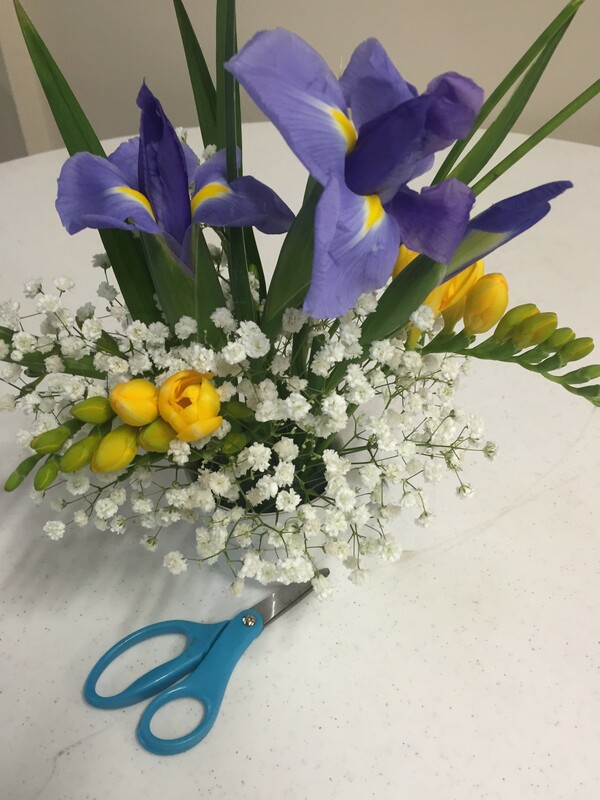 Create your own floral arrangement featuring sunflowers and then have the group sit in a circle around the arrangement. 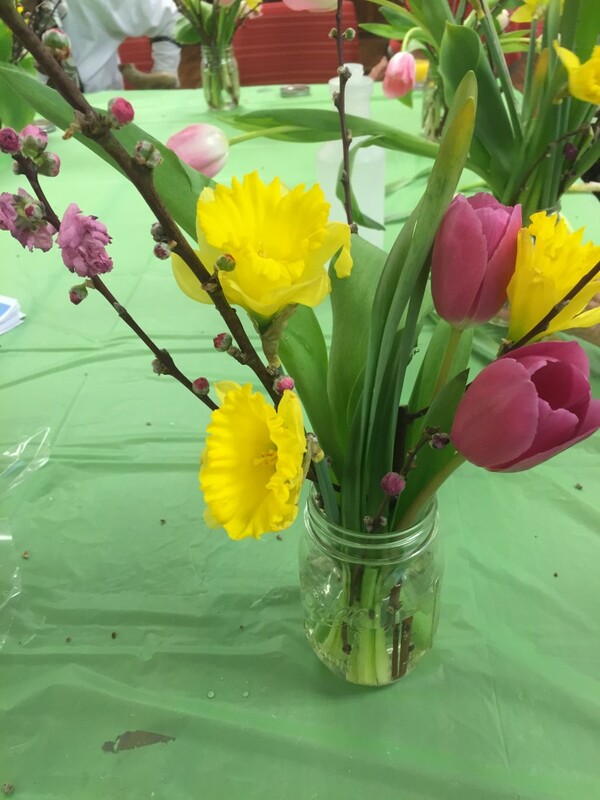 Then encourage them to paint or sketch a still life from their perspective. Paintings and sketches will most likely be different from all angles and can be a good topic about perspective in a group discussion. 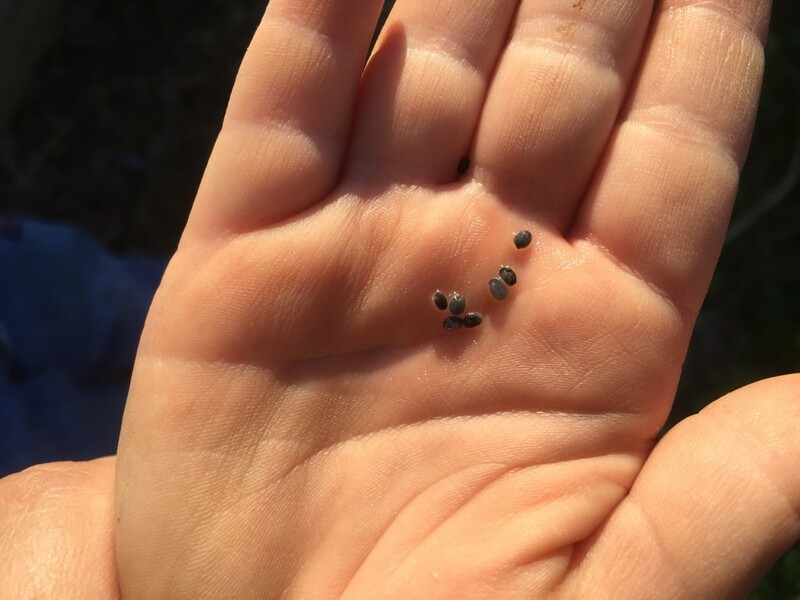 Harvest sunflower seed once ripened. 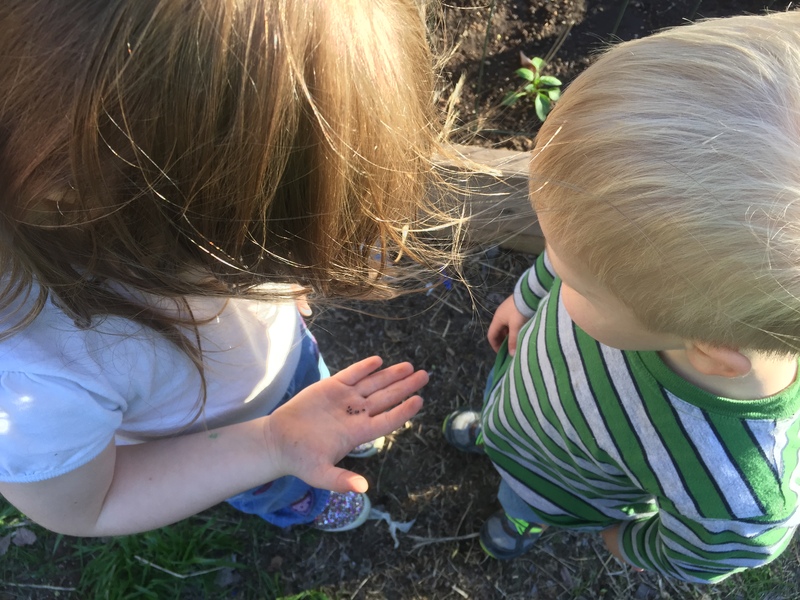 Pick the sunflower seeds out of the flower head by hand – this challenges fine motor skills. Orchids attract passion and mystery. What is it that stirs the hysteria for these intriguing plants? 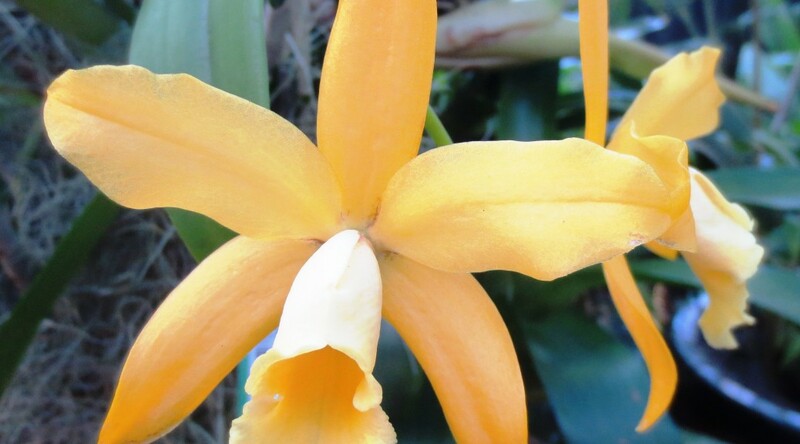 Check out this interesting list of orchid facts. The word orchis is derived from the Greek word meaning “testicle,” referring to the shape of bulbous roots found in some orchid genera (Flowerweb). The term orchid, as a shortened version of Orchidaceae, was not introduced until 1845 (Flowerweb). Many scientists suspect that hybridized orchids would not occur in nature and that there are more species yet undiscovered, especially in tropical areas (Kramer, 2013). 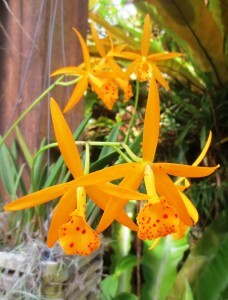 Some orchid species can survive up to 100 years (Flowerweb). Botanists studied “one thousand wild orchids for fifteen years and during that time only twenty-three were pollinated.” Some orchid seedpods are filled with millions of tiny dust-sized seeds (Orlean, 1998). The world’s first orchid book Orchid Guide for Kuei-men and Chang-chou, written by Chao Shih-ken, was published in 1228 in China (Orlean, 1998). During the Ming dynasty, orchids were used to treat a range of health issues, including diarrhea, venereal diseases, neuralgia, and sick elephants (Orlean, 1998). Victorian women were forbidden from owning orchids because the flower shapes were considered to be sexually suggestive (Orlean, 1998). 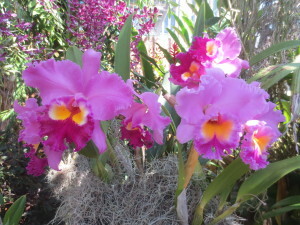 The Florida connection to orchids began in 1874, when it is reported that avid gardener Jane Kenniburgh moved from Carickfergus, Ireland, to Tallahassee, Florida, with her Phaius grandifolius orchid, often referred to as nun’s lily. 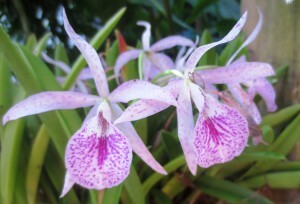 This orchid was recognized as the first greenhouse-cultivated orchid in Florida (Orlean, 1998). Orchids in this article were photographed at Marie Selby Botanical Gardens in Sarasota, Florida. Dearringer, M. (no date). Seven Little Known Orchid Facts. Retrieved Dec. 4, 2015 from http://www.orchidplantcare.info/a-few-fun-facts-you-might-not-know-about-orchid-plants/. Flowerweb (no date). 15 Amazing Facts About Orchids. 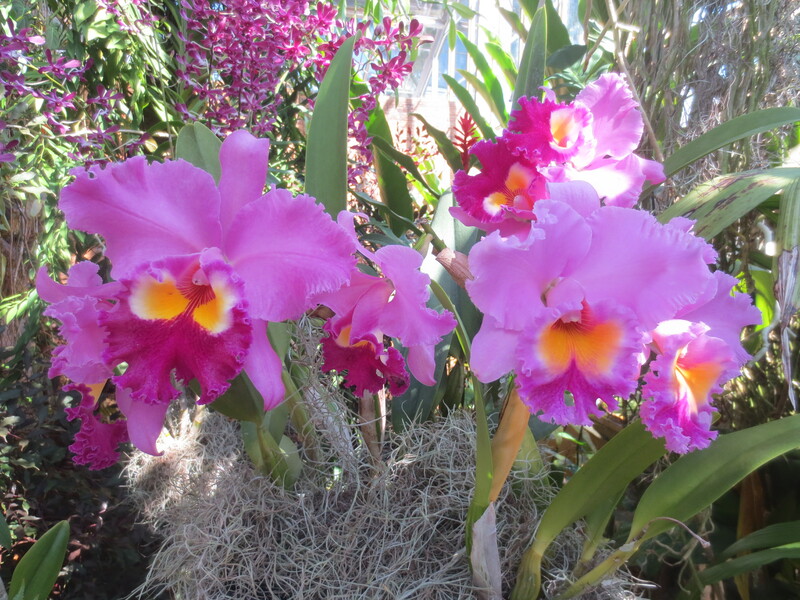 Retrieved Dec. 4, 2015 from http://www.flowerweb.com/en/article/190242/15-Amazing-Facts-About-Orchids. Kramer, M. (2013). 5 Surprising Facts About Orchids. 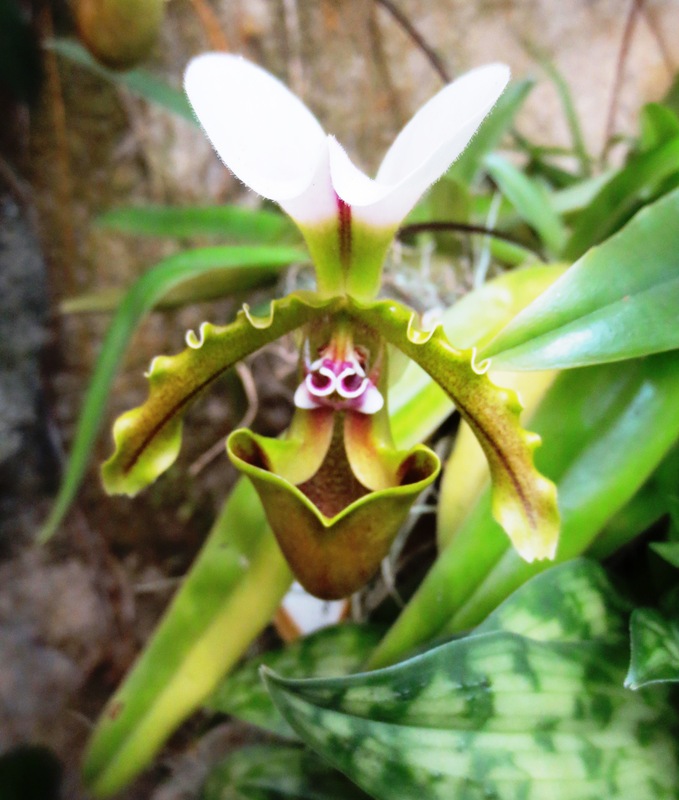 Retrieved Dec. 4, 2015 from http://www.livescience.com/28547-surprising-orchid-facts.html. Orlean, S. (1998). The Orchid Thief. New York: Random House. Hippocrates, Roger Ulrich, and E.O. Wilson…their perspectives on how nature impacts human health brought about seismic changes in medicine, research, healthcare facility design and much more. 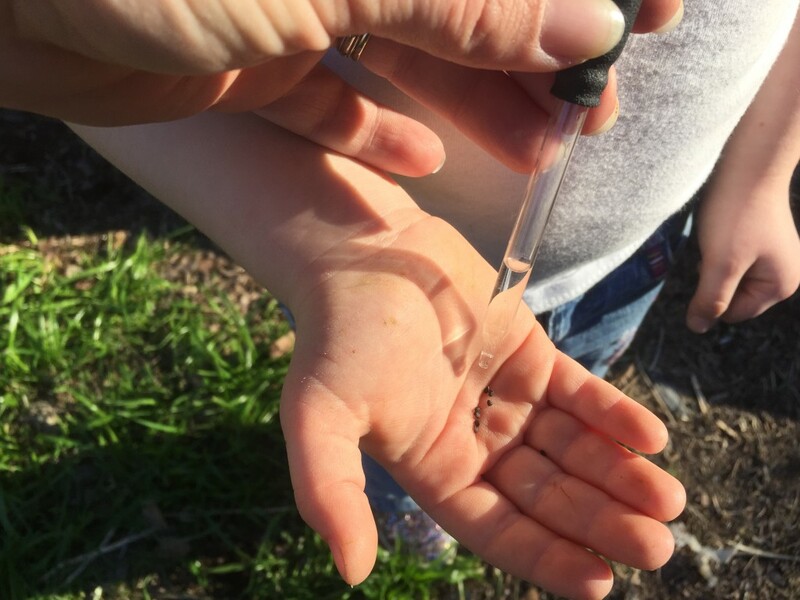 Hippocrates, 460BC-370 BC, who is considered to be the father of medicine, introduced Vis Medicatrix Naturae — the concept of the healing power of nature. 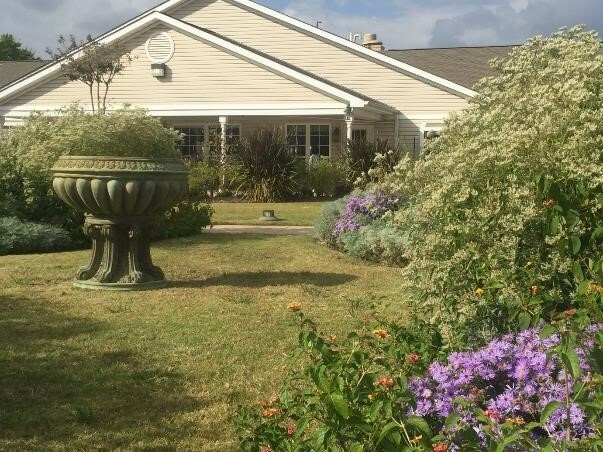 It became a guiding principle across disciplines and is still considered today to be powerful and relevant, linking nature (including horticulture) to human health. Roger Ulrich, 1984, conducted research which revealed that views of nature influence faster health recovery in hospital patients. Frequently cited for this research and his work on evidence-based healthcare design, Ulrich has had global influence on nature-health connections. E.O. Wilson, 1986, popularized the hypothesis that humans have an instinctual need to connect with nature. This concept — and Wilson’s book of the same name — Biophilia has come to signify the need to integrate nature into our lives…using it to find balance and understanding of the inter-relatedness of all living things. Celebrate the festive season with beloved holiday plants. To make the most of these colorful, live plants in the dark days of winter, consider the following tips. 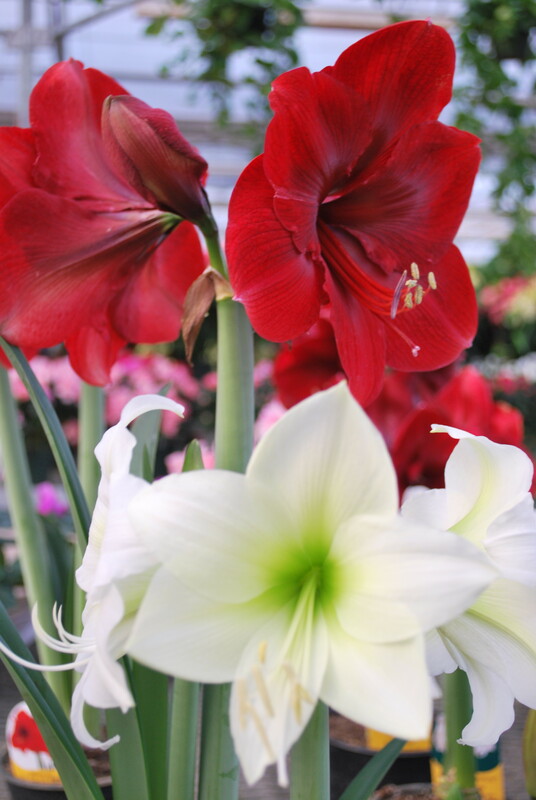 Show-stopping sizes (miniature to large), double blooms, and a color spectrum from pure white or deep red to salmon orange and even stripes, amaryllis feels like a holiday miracle. 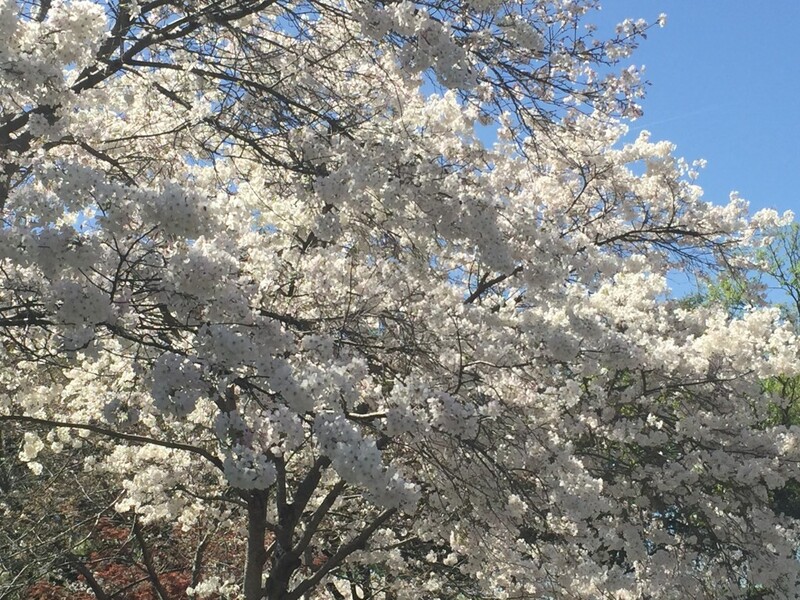 Watch it grow daily until the blossom opens before your very eyes. 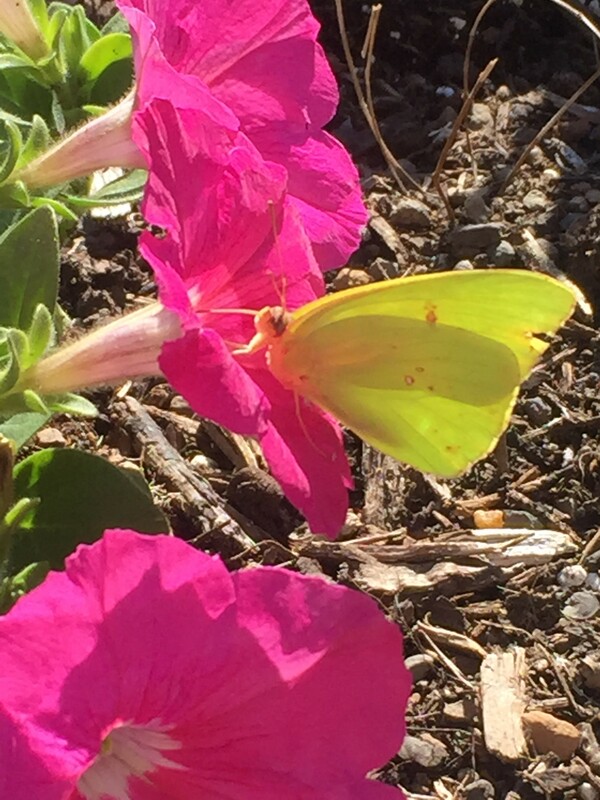 Note that the larger the bulb, the larger the flower. Flowering occurs four to eight weeks after planting with the succession of bud openings lasting two weeks. 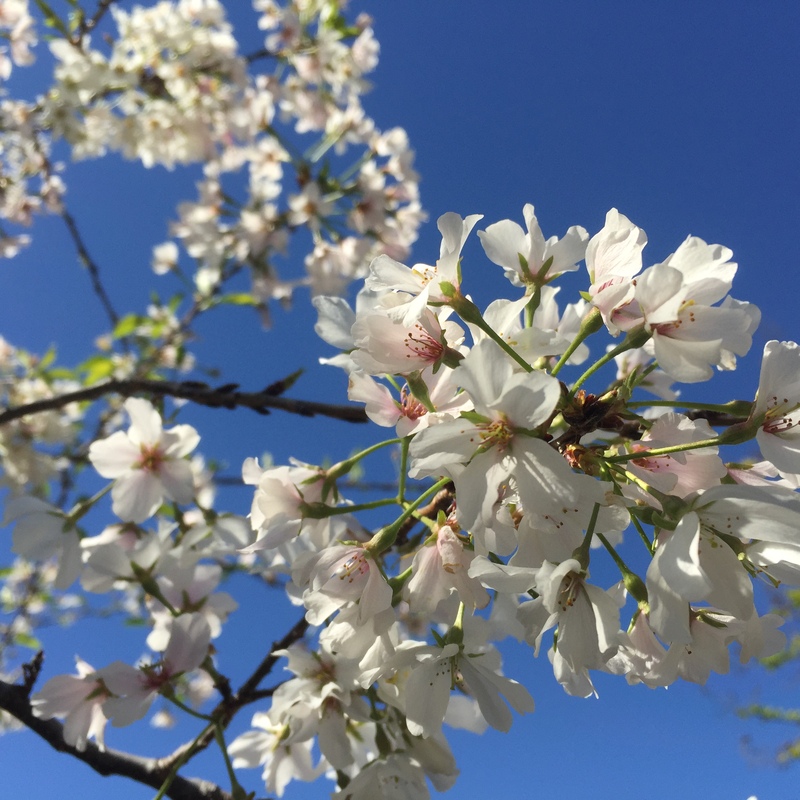 Buds prefer several hours of direct sunlight and temperatures of 75-80 degrees F. Watering is not necessary once bud has cracked. 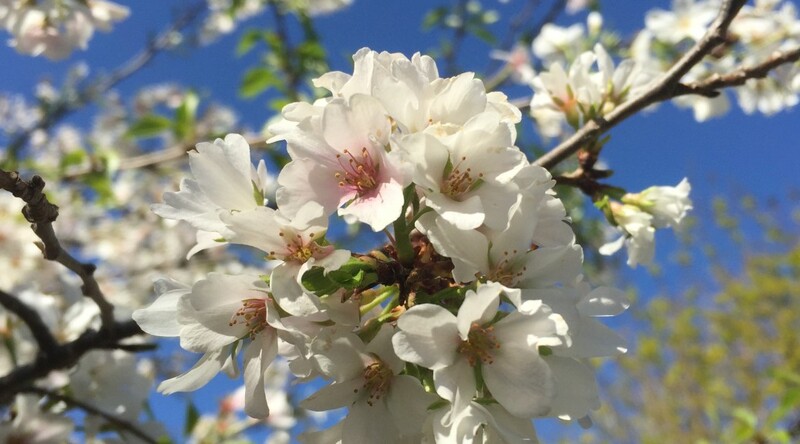 Blossoms can be prolonged by moving flowers out of direct sunlight. 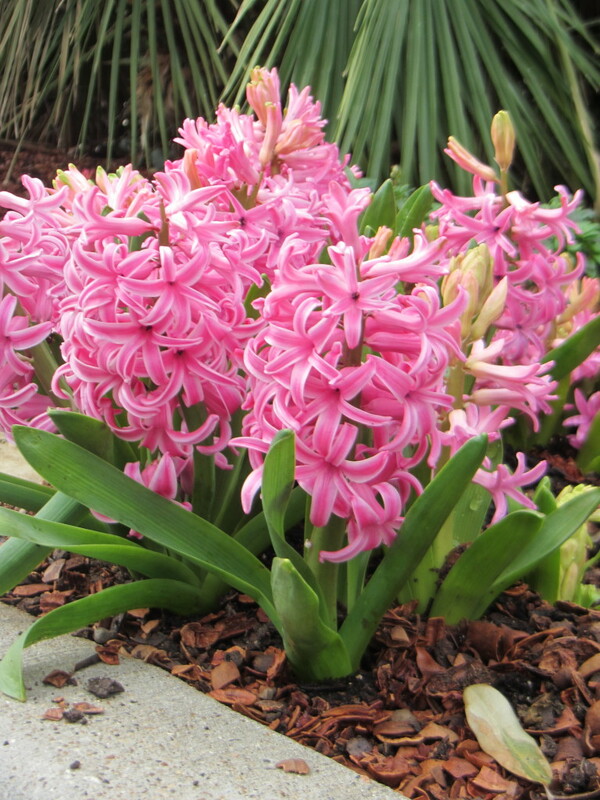 Bulb will re-bloom in container or garden bed in milder climates. 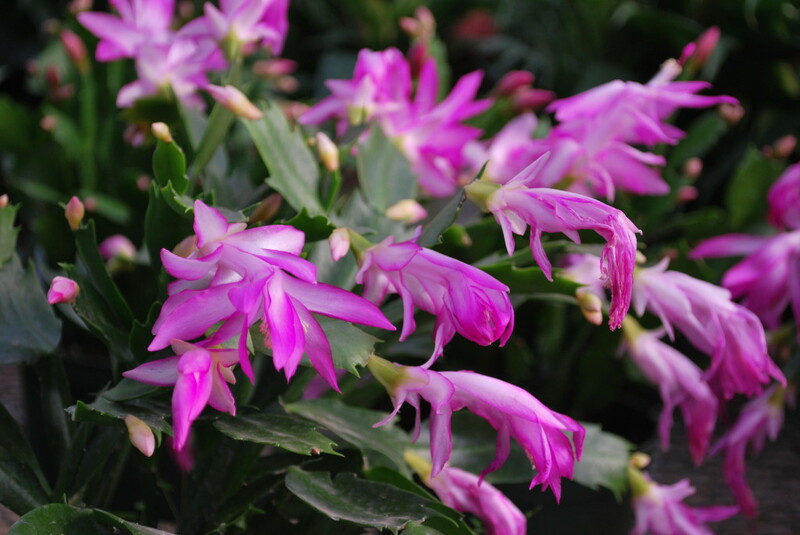 Colorful and readily available in the holiday season, Christmas cactus are regarded as easy to maintain houseplants. 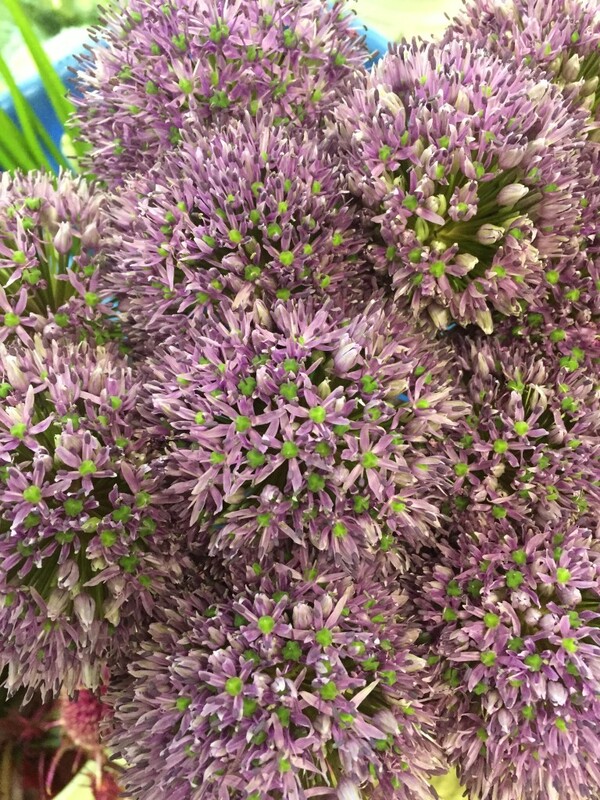 In preparation for the holidays, the grower will have ensured 12 hours of darkness required for blooming at just the right time. The plant prefers to be in bright indirect light, root-bound in containers and soil drying between watering. Cuttings taken from Christmas cactus can be easily propagated. Once home, place the fresh cut trunk in an appropriately sized reservoir-type stand that holds water. To prevent drying, place tree away from heat sources, keep tree watered, lower temperatures at night, and use low heat tree lights. Consider recycling the tree. 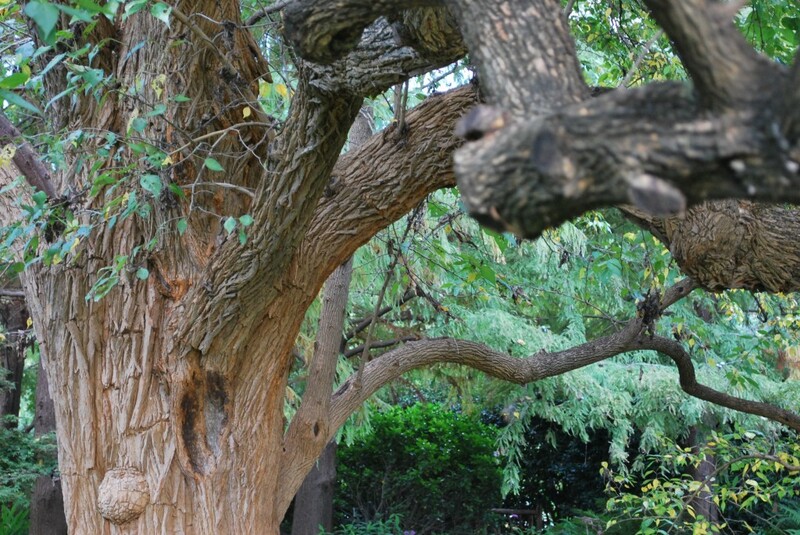 Check out tips on how to care for a live tree with roots here. 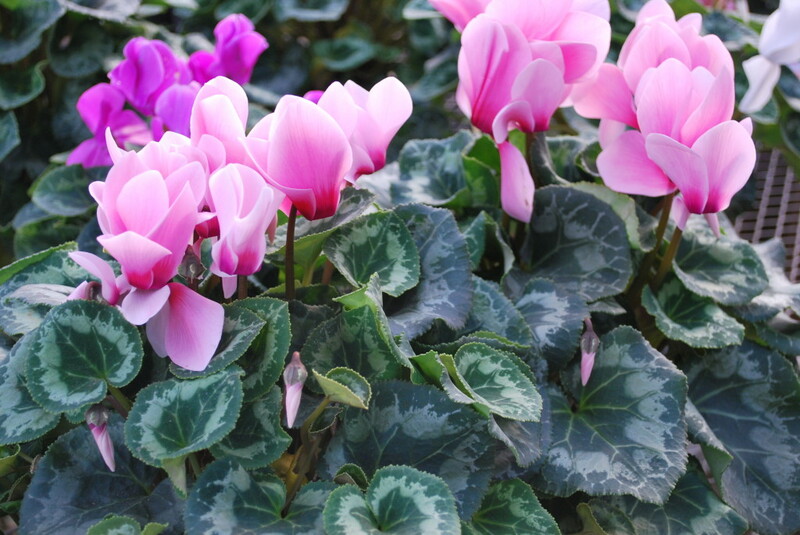 Ruffled flowers in white, pink, and red, heart shaped leaves, and blossoms of every size make this plant charming. 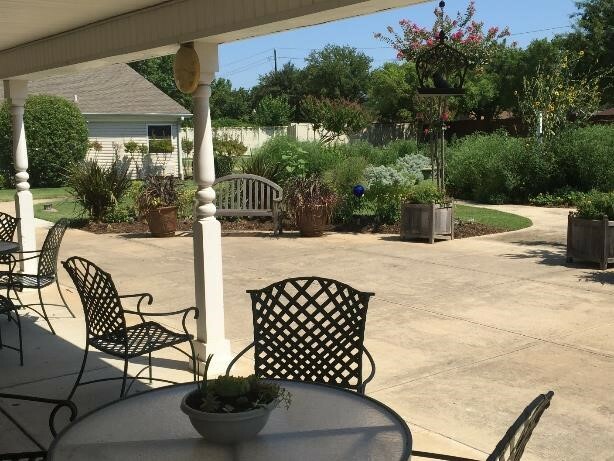 Avoid direct sunlight, provide good drainage watering from the roots up, and use water soluble fertilizer every two months. For re-blooming, let leaves die back, stop watering, place plant in cool, dark place, and let sit for several months. Then soak soil and resume regular care. 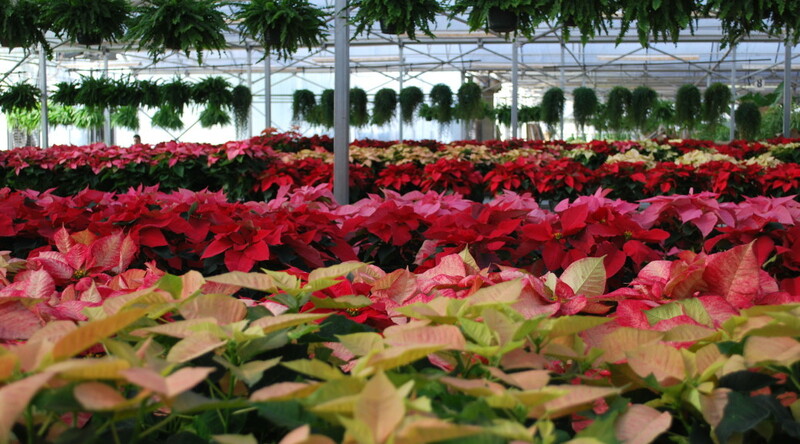 Now available in double blooms and many colors-pink, red, burgundy, yellow, white and even marbled colors, poinsettias are popular because they thrive for long periods of time with minimal care. They prefer temperatures of 70-80 and direct sunlight, but no drafts or sitting water. Poinsettias are not poisonous but the milky sap may irritate skin. 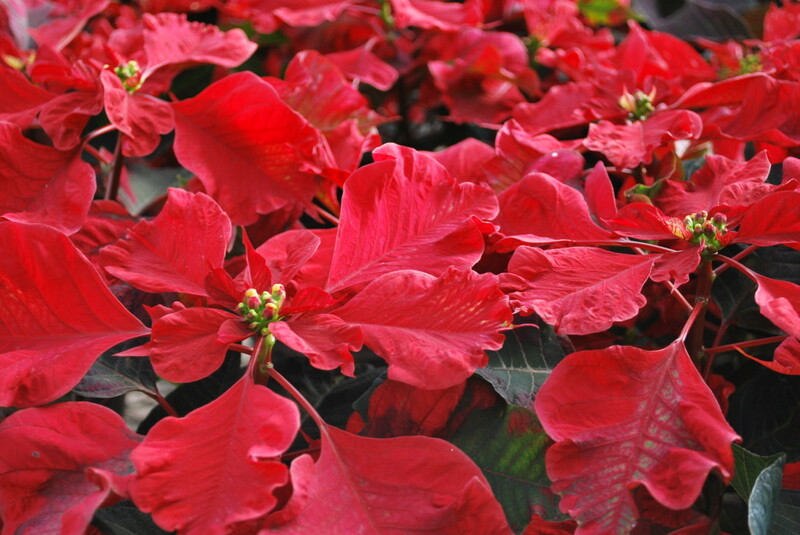 Read about growing poinsettias outdoors here. Authors Lesley Fleming and Sarah Bayat combine their talents for this series. Lesley is a registered horticultural therapist who uses holiday plants for therapeutic activities. Sarah is creative director of Floris Flowers Co. 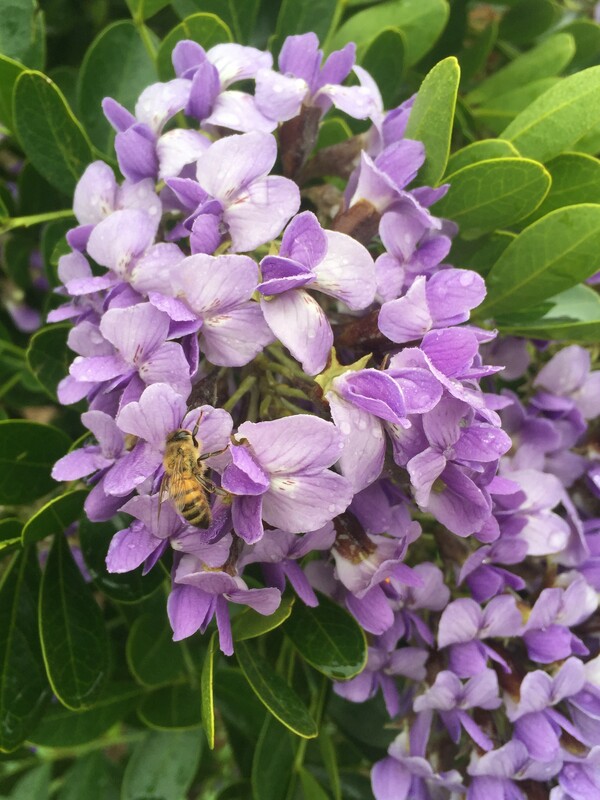 This is the second in a series of four articles sharing tips on seasonal plants. 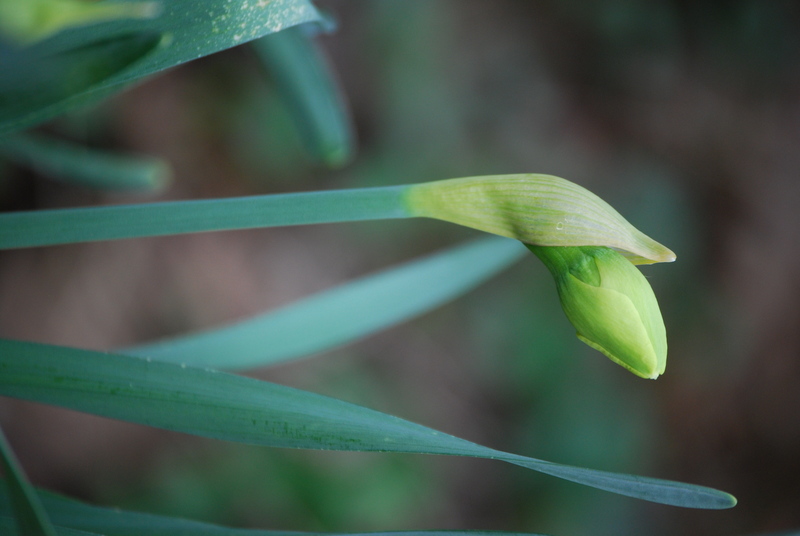 The third article will offer tips for spring bulbs. Just like people, plants can tell some interesting stories. Check out the tales of these trees. Wollemi pine (Wollemia nobilis). A prehistoric tree that grew 90 million years ago, the Wollemi pine was thought to be extinct until a stand of the trees was found about 20 years ago growing in a national park just north of Sydney, Australia. The photo above is of a Wollemi pine taken at the Royal Botanic Gardens, Kew, in London, England, about ten years ago. 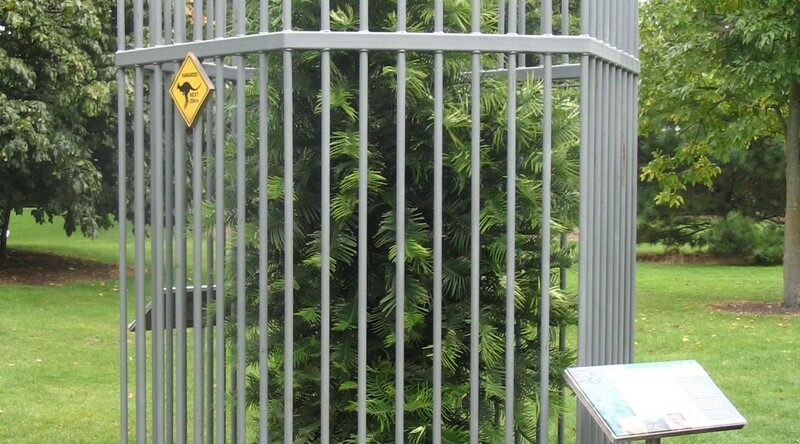 Read more about the Wollemi pine here. Japanese white pine (Pinus parviflora). A nearly 400-year-old Japanese bonsai survived the Hiroshima blast and is now located at United States National Arboretum in Washington, D.C. Read more about this bonsai here and here. Lodgepole pine (Pinus contorta). The 1988 fires burned over one million acres in Yellowstone National Park. 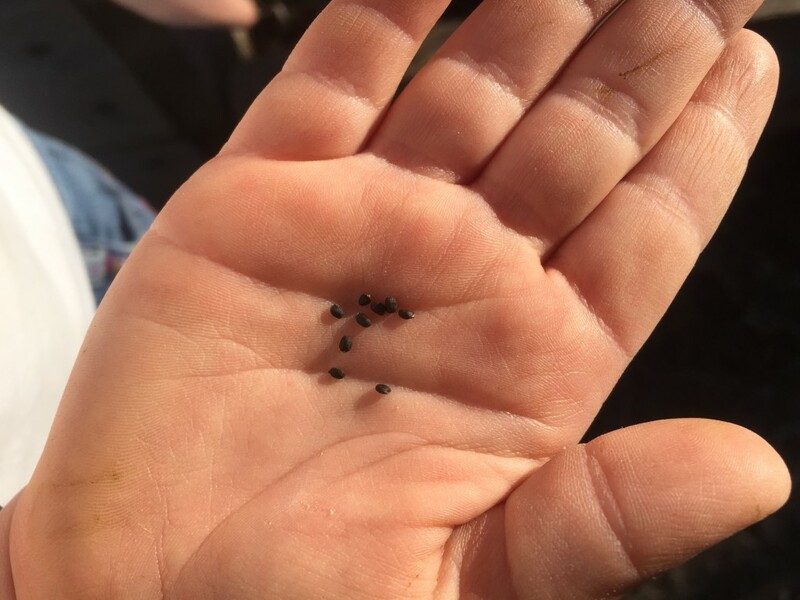 Though it burned through acres of vegetation, the fire actually heated up the resin within the pine cones of the lodgepole pine, releasing the seeds which otherwise would have been held captive inside the cones for many years. Many seedlings germinated by the following year. 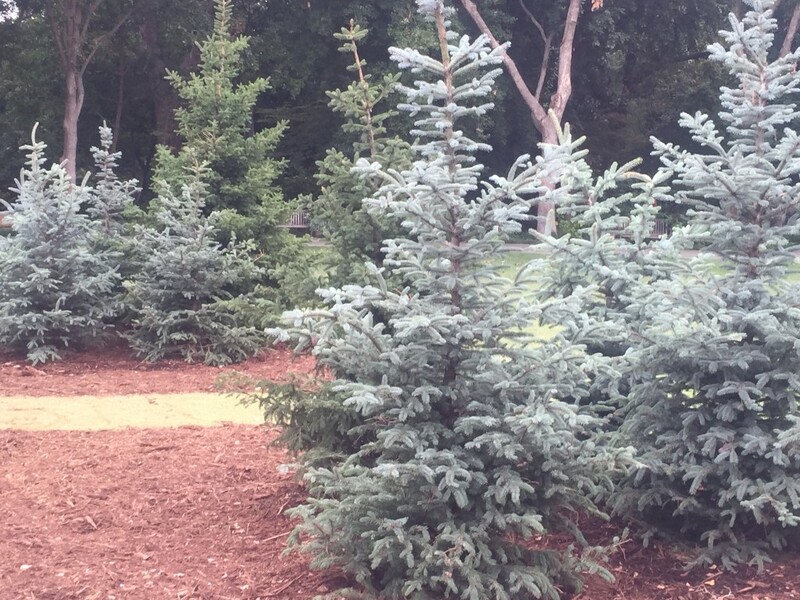 Read more about the lodgepole pine here. General Sherman giant redwood (Sequoiadendron giganteum). The world’s largest tree by volume is located in the Sequoia National Park in California. Check out the stats on the General Sherman tree here. I like it when a flower or a little tuft of grass grows through a crack in the concrete. It’s so…heroic. Resilient, strong, tough, hardy, adaptable, vigorous – these are all adjectives used to describe someone who is a warrior…as well as to describe plants as botanical warriors in their own right. 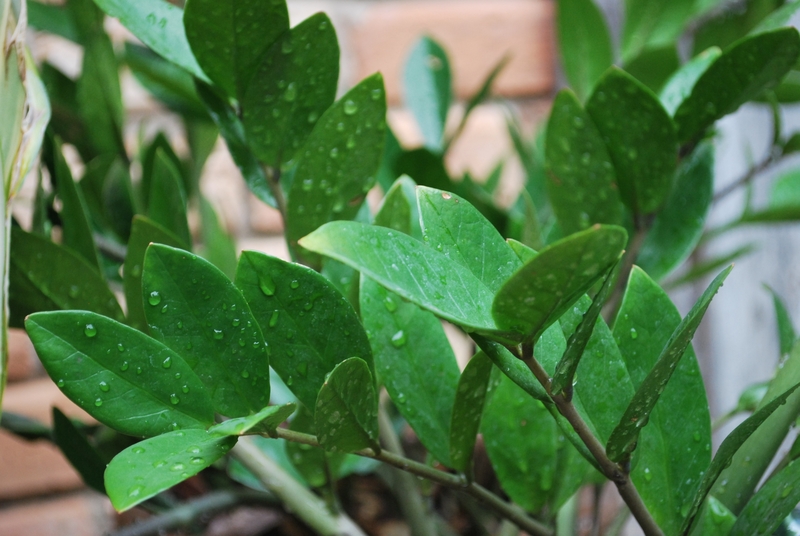 Some plants grow fully submerged in water or germinate from a minuscule seed, while others grow perched atop the tree canopy of a tropical rain forest or have thick leaves that help them retain moisture in the most arid growing conditions. 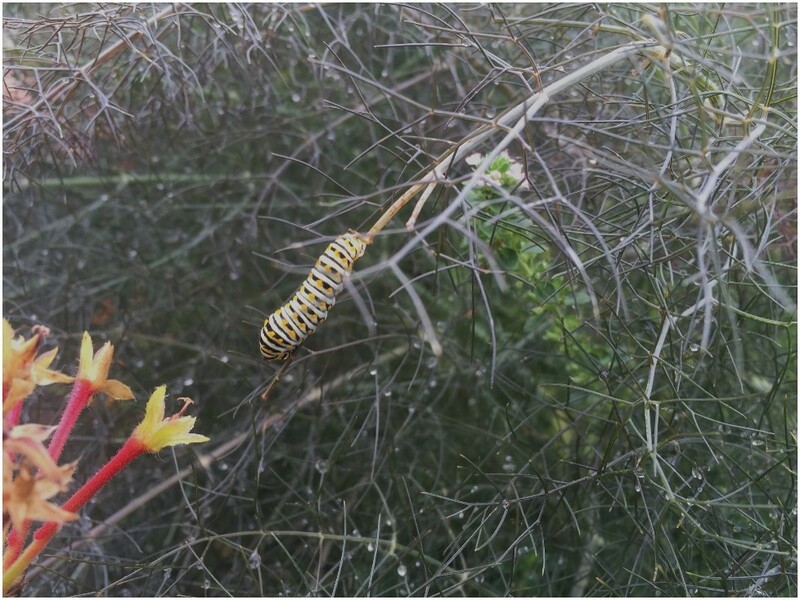 Plant characteristics, such as their growth habits and forms, growing requirements, methods of reproduction, and other biological functions, play a major factor in determining how they thrive or fail in an environment. Due to their adaptations over time and resilience enduring nature’s elements, plants are often used as symbols of strength, hope, and inspiration. For example, trees are often referred to as symbolic representations of strength and power with their sturdy woody stems, extensive root systems that hold them upright and steadfast, lengthy life spans, ability to provide shelter and food, and other qualities. 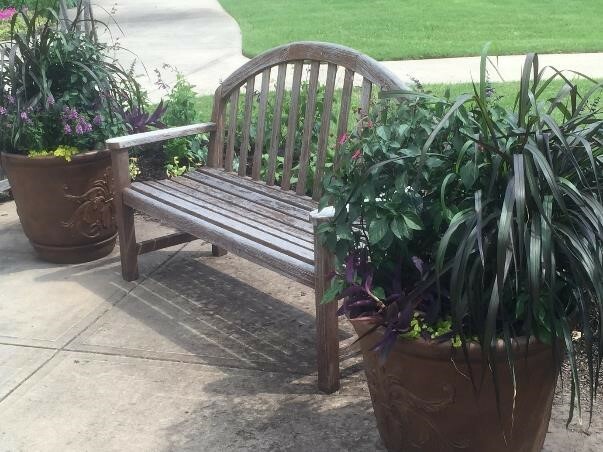 When horticultural therapy clients learn about how plants endure tough growing conditions to flourish, these observations can help clients find perspective about situations they are dealing with or give them something to view as a symbol of inspiration. 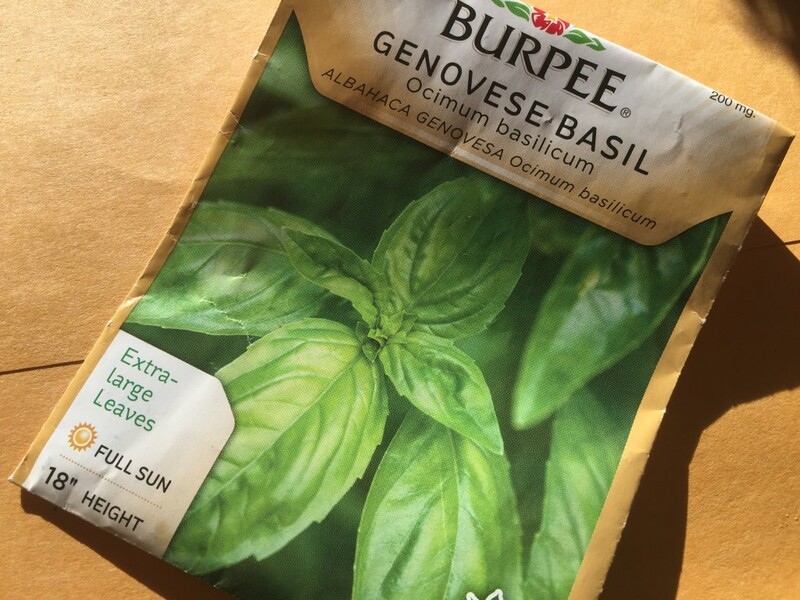 Consider incorporating these plants with strong characteristics or names or that have historical use by mighty people into an inspirational lesson on building personal strength and overcoming obstacles. 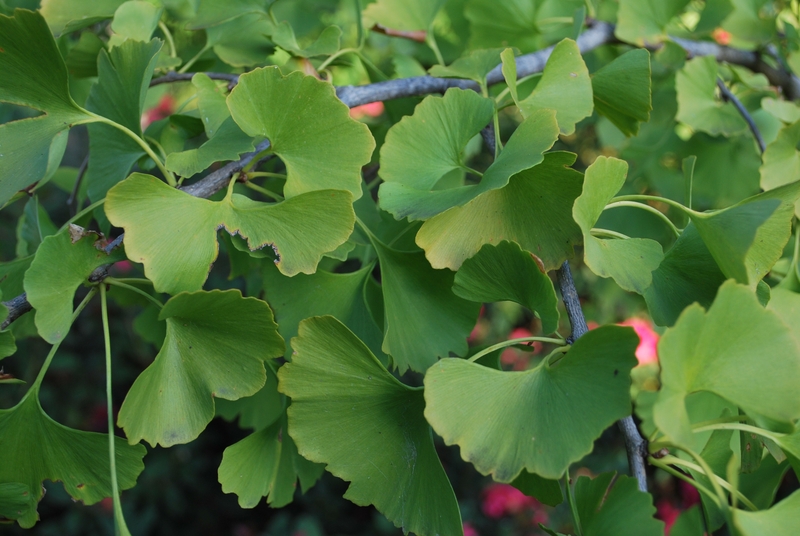 A living fossil with unique fan-shaped leaves, ginkgo is a long lived tree with prehistoric ties. Its length of time on Earth and long life span has made it a symbol of resilience and endurance. In fact, several trees, including at least four ginkgos, survived the atomic blast in Hiroshima, Japan, and are still growing today. Note: Has toxicity if eaten in large quantities. Hardy in USDA Zones 3 to 8. 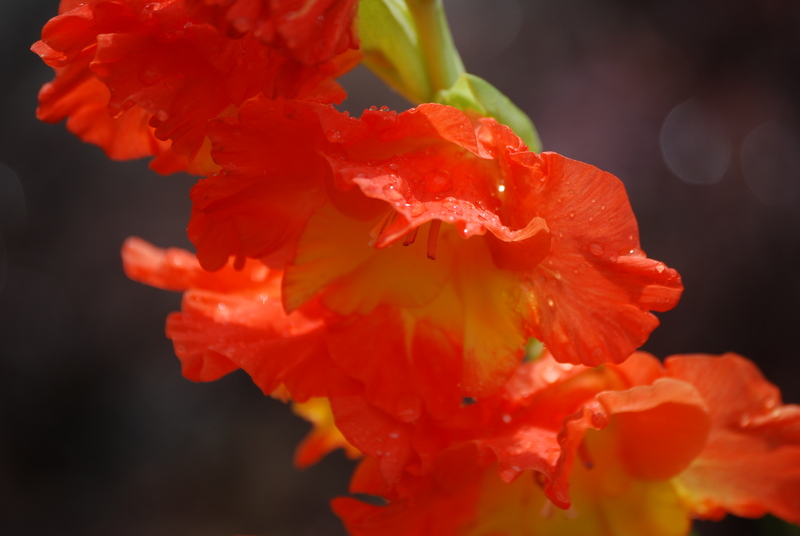 In the language of flowers, gladiolus symbolizes strength of character, and legend even has it that gladiolus was the representative flower of the Roman gladiators. With its sword shaped leaves and colorful flower spikes, gladiolus’ name is derived from the Latin word for “sword.” Other plants known to symbolize strength include fennel, thyme, garlic, oak, and bamboo. Note: Has toxicity. 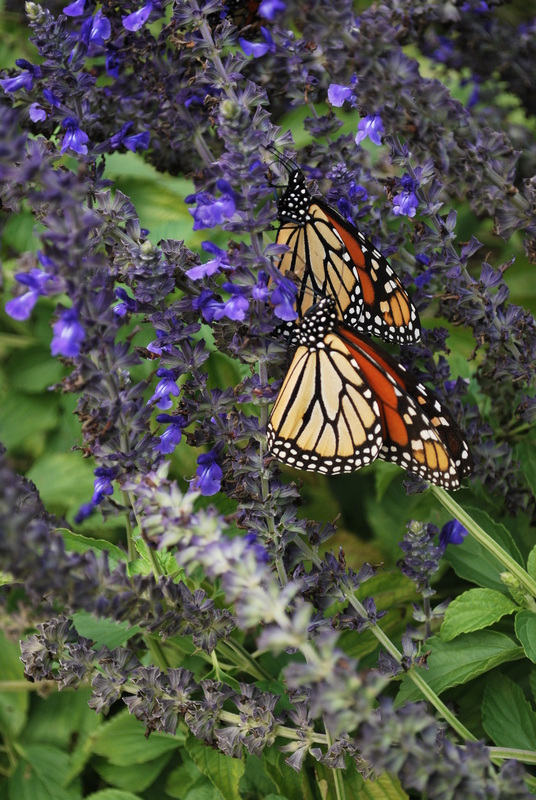 Commonly used as a cut flower; hardy in USDA Zones 8 to 11. Epiphytes, or air plants, are resilient plants that grow on something else, such as on a tree or a rocky ledge, yet are not parasitic. Unlike their terrestrial counterparts, they have special adaptations on their leaves and roots that help obtain their water and nutrients from the air, rainfall, leaf litter, and other nearby sources. 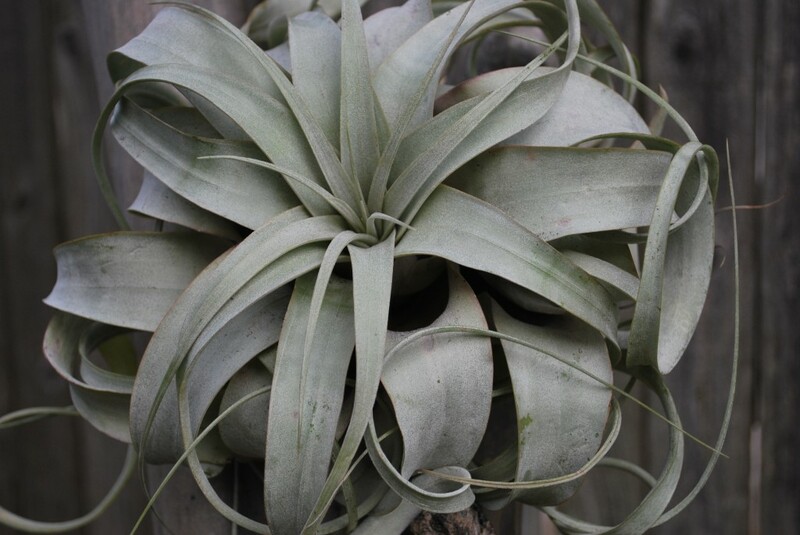 Epiphytes include several orchids, bromeliads, ferns, and other air plants, such as Tillandsia xerographica. 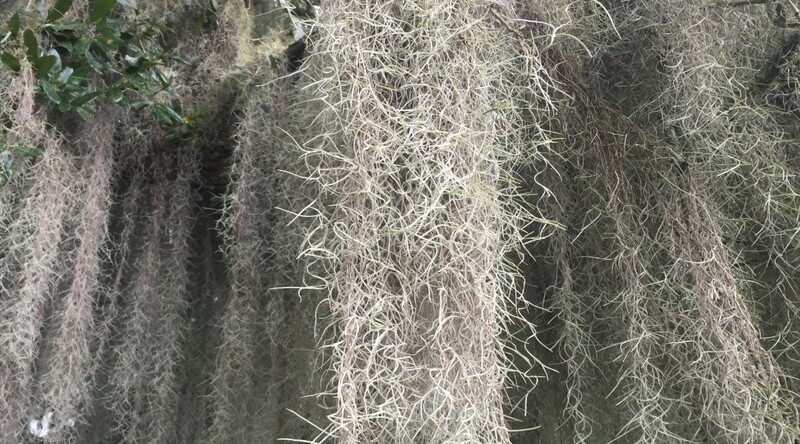 Spanish moss (shown in feature image), which is often seen growing in live oaks in the deep South, is not an actual moss but, rather, is a Tillandsia. Some grown as houseplants; Spanish moss (T. usneoides) is hardy in USDA Zones 8 to 11. The phrase “ZZ plants are E-Z” is true and makes ZZ plant a candidate for the top of any list of low maintenance houseplants. Though they are slow and steady growers, this tough houseplant has a high tolerance level for neglect. 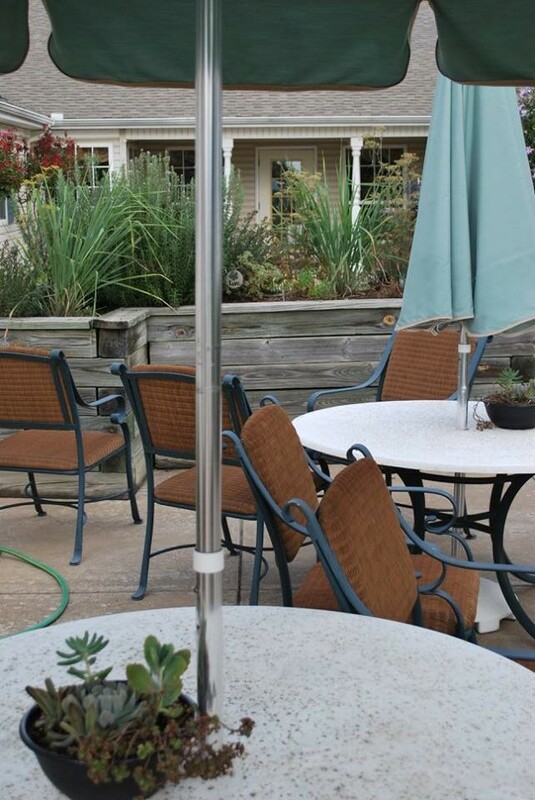 It does well with infrequent watering and in low light conditions when a light stand or sunny window is not available. Note: this plant has toxicity. Grown as a houseplant. Ethnobotanical researchers have described how Native Americans historically used the dense, tough wood of the Osage orange, otherwise called bois d’arc, to fashion bows. (Watch out for the female trees that wield softball-sized green fruit that plummet to the earth.) Red twig dogwood (Cornus sericea) and various species of serviceberry (Amelanchier), juniper (Juniperus), and cedar (Thuja) were also used for making bows, arrows, or totem poles by various Native American tribes. Hardy in USDA Zones 5 to 9. The lotus is an aquatic plant that grows in the muddy margins of ponds and marshes. Its flower is considered sacred in Buddhism and Hinduism and is commonly used in imagery of rebirth and enlightenment in Asian art. 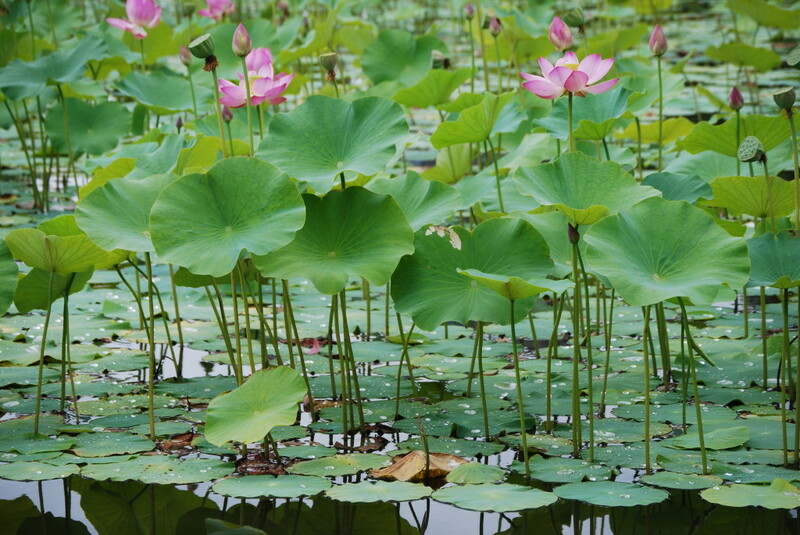 Leaves and flowers grow from the rhizomes buried underwater in the mud and rise up tall above the water surface. In addition, its leaves are hydrophobic, meaning that water droplets bead up on leaves like drops of mercury and fall off easily. Hardy in USDA Zones 5 to 10. 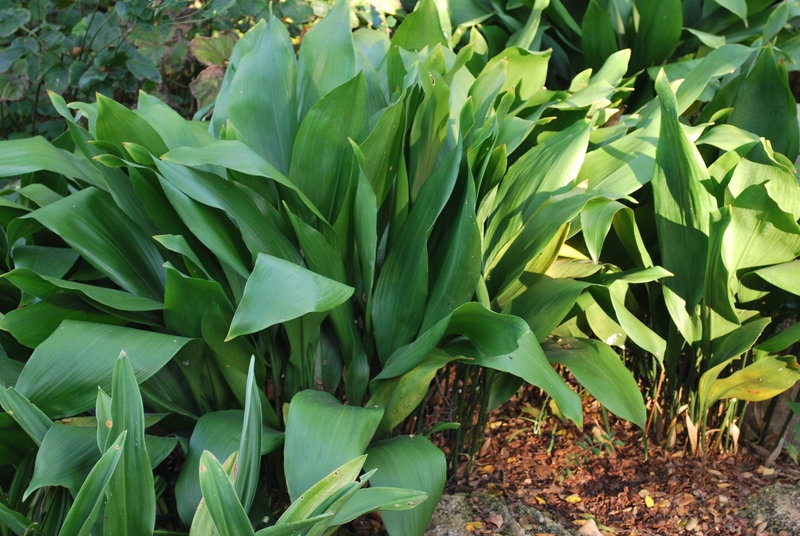 As its name suggests, cast iron plant is the houseplant that is tough as nails – cast iron nails, at that – as its name suggests. It thrives in low light and with minimal watering. Commonly grown as a houseplant; also hardy in USDA Zones 7 to 11. Over the course of three and a half billion years of environmental fluctuations and catastrophes, organisms of all types have developed tremendous powers of regeneration. 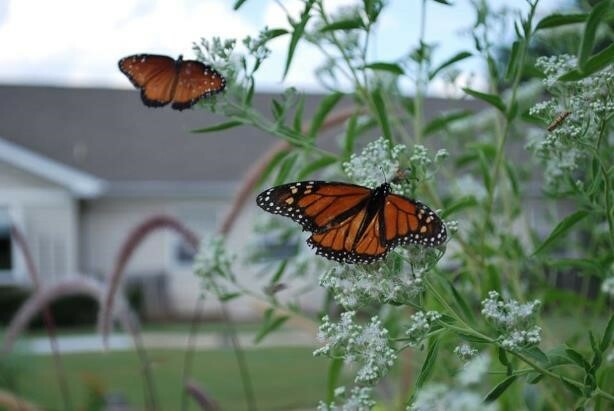 Some species, typically referred to by humans as weeds, seem especially adept at not merely surviving severe disturbance, but of actually flourishing in the face of it. Del Tredici, P. Hibaku Trees of Hiroshima. Retrieved on 29 October 2013 from http://arnoldia.arboretum.harvard.edu/pdf/articles/892.pdf. Laufer, G.A. (1993). 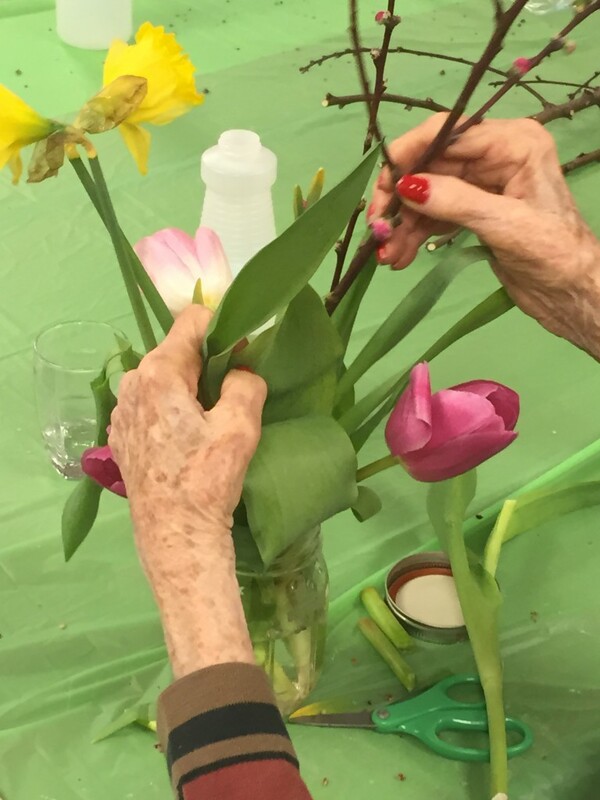 Tussie-Mussies: The Language of Flowers. Workman Publishing Company, Inc.: Hong Kong. Marie Selby Botanical Gardens. (2013). What are epiphytes? Retrieved from http://www.selby.org/about/what-are-epiphytes. Missouri Botanical Garden. (2013). Biology of Plants: Plant Adaptations. Retrieved from http://www.mbgnet.net/bioplants/adapt.html. University of Michigan – Dearborn. (2013). Native American Ethnobotany Database. Retrieved from http://herb.umd.umich.edu/.